Fine needle biopsy (FNB) is a procedure in which a small-caliber needle is placed into a mass, cellular material is removed, and a cytologic diagnosis is rendered. It is widely accepted as one of the most useful diagnostic procedures in the evaluation of neck masses. Fine needle biopsy helps to distinguish inflammatory, reactive, or cystic lesions from neoplasms as well as benign neoplastic lesions from malignant ones. Fine needle biopsy is relatively safe, simple, and cost-effective, and it is well-tolerated by most patients. However, close attention must be paid to proper technique to ensure accurate results. The neck is the part of the body that separates the head from the torso. The Latin-derived term cervical means "of the neck." The neck supports the weight of the head and is highly flexible, allowing the head to turn and flex in different directions. The midline in front of the neck has a prominence of the thyroid cartilage termed the laryngeal prominence, or the so-called "Adam's apple." Between the Adam’s apple and the chin, the hyoid bone can be felt; below the thyroid cartilage, a further ring that can be felt in the midline is the cricoid cartilage. 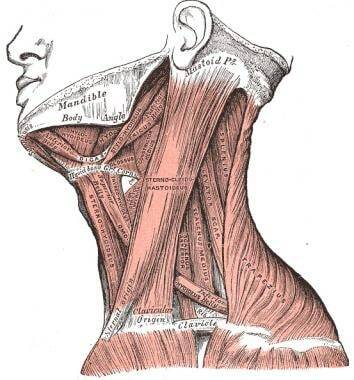 Between the cricoid cartilage and the suprasternal notch, the trachea and isthmus of the thyroid gland can be felt. The quadrangular area is on the side of the neck and is bounded superiorly by the lower border of the body of the mandible and the mastoid process, inferiorly by the clavicle, anteriorly by a midline in front of the neck, and posteriorly by the trapezius muscle. The image below depicts the anterior cervical muscles. For more information about the relevant anatomy, see Neck Anatomy. No absolute contraindications exist to performing fine needle biopsy of neck masses. Fine needle biopsy can be performed without increased concern in patients taking aspirin or nonsteroidal anti-inflammatory drugs (NSAIDS). The use of local anesthesia prior to fine needle biopsy (FNB) of neck masses is at the discretion of the practitioner. Some authors do not recommend the use of local anesthesia prior to fine needle biopsy, especially for superficial masses. [1, 4, 5] They note that the injection of local anesthetic can cause as much pain as the fine needle biopsy itself. Additionally, infiltration of local anesthesia might make a small mass more difficult to palpate. One author recommended placement of a small ice pack on the overlying skin prior to biopsy. For children, application of a topical anesthetic 30-60 minutes before the procedure can reduce pain and anxiety. For more information, see Topical Anesthesia. Other authors argue that the use of local anesthesia reduces patient discomfort and anxiety. Lidocaine 1-2% with or without 1:100,000 epinephrine is the agent of choice. The anesthetic is slowly infiltrated through a 30-gauge needle into the uppermost portion of the subcutaneous fat plane and allowed to back-infiltrate the dermal nerves, thus avoiding a painful dermal wheal. Usually, cutaneous anesthesia is all that is needed to provide for a painless fine needle biopsy. Occasionally, deeper infiltration of anesthetic is needed if the target mass is inflamed. For more information, see Infiltrative Administration of Local Anesthetic Agents. Equipment is depicted in the image below and includes the items listed. Needles: Most authors use 22- to 27-gauge needles of appropriate length [1, 5, 6, 10, 15] with clear or translucent hub. 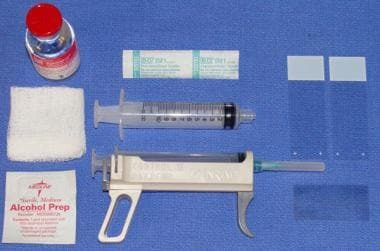 Pistol grip syringe holder (if aspiration technique used): This is highly recommended and allows more uniform suction and easier manipulation of the needle. The goal of positioning in a fine needle biopsy of the neck is to provide good access to the target mass with maximum comfort for the patient. In most cases, the patient in placed in the supine position. The position of the patient for obtaining a biopsy of the lymph nodes of the neck varies. Nodes become more or less palpable according to the rotation of the head and flexion or extension of the neck. Obtain informed consent. Patients should be advised of the very small possibility of infection or hematoma. Label specimen slides with the patient's identification before the procedure is begun. Place the patient in the proper position. Clean the skin overlying the target mass with a pad or swab prepared with alcohol (or povidone-iodine [Betadine]), then dry with sterile gauze. Administer local anesthesia, if desired. The aspiration technique is shown in the video below. Fix the target mass between 2 fingers of the nondominant hand. Advance the needle, attached to the syringe, into the mass. Do not apply suction during the advancement. Once the needle tip is within the mass, apply suction by pulling back on the plunger of the syringe. While maintaining suction, move the needle rapidly back and forth with short strokes within the mass. Release negative pressure after sampling is completed and before withdrawing the needle from the mass. Withdraw the needle. The cytologic specimen is within the needle and, perhaps, the hub of the needle. Once withdrawn, detach the syringe from the needle. Fill the syringe with air and then reattach it to the specimen-containing needle. Expel the specimen onto a glass microscope slide as described below. The Zajdela technique is shown in the video below. Hold the needle by the hub between the thumb and index finger. Advance the needle into the target mass. Move the needle back and forth within the mass with short, rapid strokes. Simultaneously, move the needle in a rotary clockwise-counterclockwise motion. Attach an air-filled syringe, with the plunger already retracted, to the specimen-containing needle. Expel the specimen onto a microscope slide. Keep the needle tip in contact with the slide to allow placement of a concentrated droplet and avoid spraying of the specimen. Spraying of the specimen is undesirable because it can result in desiccation of the specimen. Residual material remaining in the hub of the needle, if desired, can be removed with a needle, endocervical brush, or fine wooden stick and placed on the slide. The goal of smearing is to provide a monolayer of cells for microscopic examination. Several methods of smearing have been described, the most common being the "one-step" and "two-step" techniques. The technique selected depends on the consistency of the specimen and the preference of the individual preparing the slide. This technique is more frequently used if the specimen is semisolid or small in volume. Place the specimen at the labeled end of the specimen slide. Hold the specimen slide with the labeled end (and specimen) uppermost. Hold the spreading slide perpendicular to the specimen slide. Hold the lower edge of the spreading slide in contact with the specimen slide in a hingelike fashion below the specimen. Rotate the upper edge of the spreading slide toward the specimen so that the spreading slide gently covers the specimen. Pull the spreading slide downward over the specimen slide in one smooth motion, with a very slight smearing pressure. The two-step technique is more frequently used if the specimen is more liquid. Hold the spreading slide parallel to and at a 45-degree angle to the specimen slide. Place one end of the spreading slide in contact with the specimen slide just below the specimen. Draw the spreading slide just into contact with the specimen, permitting the drop of material to spread along the line of contact by surface tension. Particles of tissue will be concentrated along this line of contact. Then move the spreading slide away from the labeled end to approximately the midpoint of the specimen slide, drawing the tissue particles with it. Quickly lift the spreading slide from the specimen slide, leaving most of the tissue particles at the mid-point of the specimen slide. Hold the specimen slide vertically for several seconds with the labeled end at the bottom, allowing some of the fluid to drain away from the tissue particles. Place the spreading slide perpendicular to the specimen slide and smear the line of tissue particles as described in the one-step technique. The clinician performing the fine needle biopsy must consult closely with the cytopathology laboratory regarding their preferred handling of the slides that hold the smeared specimen. The stains used for each technique are different. The wet-fixation technique includes immersion of the slide into 95% ethanol or use of a spray fixative. Immersion in 95% ethanol works well, though entails some inconvenience in the storage and transportation of the liquid fixative. Spray fixatives generally consist of ethyl alcohol or isopropyl alcohol mixed with polyethylene glycol. The alcohol quickly evaporates, leaving the smeared specimen covered with the glycol. Treated slides can then be easily stored, mailed, or immediately processed. Stains specific to the wet-fixation technique include Papanicolaou and hematoxylin-eosin (H&E). The smeared slide is processed simply by allowing it to air-dry. For optimal results, drying should occur quickly. Many laboratories use a hair-dryer or hand-held air fan to speed drying. Stains specific to the air-drying technique include Wright-Giemsa and Diff-Quick (a modified Wright-Giemsa stain). Examples of liquid-based collection vials include ThinPrep and SurePath. If a large mass (>3 cm) is biopsied, material should be obtained from the margin of the mass as well as the center. Large masses often have hemorrhage and necrosis in the center. Diagnostic cells can often be obtained from the margins. Fine needle biopsy (FNB) of the neck has a very low morbidity rate. In several large studies, only a limited number of minor complications were noted. Severe complications are rare. Needle-tract seeding of malignant cells resulting from fine needle biopsy is a theoretical concern but appears to be very rare and clinically insignificant when needles 23 gauge or smaller are used. [1, 26] Needle-tract seeding has been microscopically identified in cases of cervical lymph node metastasis of adenocarcinoma and squamous cell carcinoma, as well as in papillary carcinoma of the thyroid. In all cases, 21-gauge needles had been used in the biopsy. However, whether such needle-tract seeding has clinical significance is not clear. [26, 27] Nonetheless, using needles 23 gauge or smaller when possible may be prudent. Amedee RG, Dhurandhar NR. Fine-needle aspiration biopsy. Laryngoscope. 2001 Sep. 111(9):1551-7. [Medline]. Zajdela A, Zillhardt P, Voillemot N. Cytological diagnosis by fine needle sampling without aspiration. Cancer. 1987 Mar 15. 59(6):1201-5. [Medline]. Kraft M, Lang F. A modified technique of ultrasound-guided fine-needle aspiration in the diagnosis of head and neck lesions. Laryngoscope. 2006 Mar. 116(3):497-8. [Medline]. Stanley MW, Lowhagen T. Basic Techniques. Fine Needle Aspiration of Palpable Masses. Boston, MA: Butterworth-Heinemann; 1993. 18-56. Orell SR, Sterrett GF, Walters MN, Whitaker D. The techniques of FNA cytology. Manual and Atlas of Fine Needle Aspiration Cytology. 3rd ed. London, England: Churchill Livingstone; 1999. 12-13. Patt BS, Schaefer SD, Vuitch F. Role of fine-needle aspiration in the evaluation of neck masses. Med Clin North Am. 1993 May. 77(3):611-23. [Medline]. Huang LY, Lee YL, Chou P, Chiu WY, Chu D. Thyroid fine-needle aspiration biopsy and thyroid cancer diagnosis: a nationwide population-based study. PLoS One. 2015. 10 (5):e0127354. [Medline]. Singh Nanda KD, Mehta A, Nanda J. Fine-needle aspiration cytology: a reliable tool in the diagnosis of salivary gland lesions. J Oral Pathol Med. 2012 Jan. 41(1):106-12. [Medline]. Abu-Yousef MM, Larson JH, Kuehn DM, Wu AS, Laroia AT. Safety of ultrasound-guided fine needle aspiration biopsy of neck lesions in patients taking antithrombotic/anticoagulant medications. Ultrasound Q. 2011 Sep. 27(3):157-9. [Medline]. Guidelines of the Papanicolaou Society of Cytopathology for fine-needle aspiration procedure and reporting. The Papanicolaou Society of Cytopathology Task Force on Standards of Practice. Diagn Cytopathol. 1997 Oct. 17(4):239-47. [Medline]. Koenigsberg RA, Dastur C, Kim R. Glomus Tumor (Head and Neck). Medscape Reference. Updated January 29, 2008. Available at http://emedicine.medscape.com/article/382908-overview. Accessed: Jan 29, 2008. Cibas ES, Alexander EK, Benson CB, et al. Indications for thyroid FNA and pre-FNA requirements: a synopsis of the National Cancer Institute Thyroid Fine-Needle Aspiration State of the Science Conference. Diagn Cytopathol. 2008 Jun. 36(6):390-9. [Medline]. Oertel YC. Fine-needle aspiration of the thyroid: technique and terminology. Endocrinol Metab Clin North Am. 2007 Sep. 36(3):737-51, vi-vii. [Medline]. Shah KA. Fine needle aspiration. J Laryngol Otol. 2003 Jun. 117(6):493-5. [Medline]. Pitman MB, Abele J, Ali SZ, et al. Techniques for thyroid FNA: a synopsis of the National Cancer Institute Thyroid Fine-Needle Aspiration State of the Science Conference. Diagn Cytopathol. 2008 Jun. 36(6):407-24. [Medline]. Suen KC. Fine-needle aspiration biopsy of the thyroid. CMAJ. 2002 Sep 3. 167(5):491-5. [Medline]. Brennan PA, Mackenzie N, Oeppen RS, Kulamarva G, Thomas GJ, Spedding AV. Prospective randomized clinical trial of the effect of needle size on pain, sample adequacy and accuracy in head and neck fine-needle aspiration cytology. Head Neck. 2007 Oct. 29(10):919-22. [Medline]. Tangpricha V, Chen BJ, Swan NC, Sweeney AT, de las Morenas A, Safer JD. Twenty-one-gauge needles provide more cellular samples than twenty-five-gauge needles in fine-needle aspiration biopsy of the thyroid but may not provide increased diagnostic accuracy. Thyroid. 2001 Oct. 11(10):973-6. [Medline]. Ghosh S, Panarese A, Parker AJ. Monocular blindness following fine needle aspiration cytology of a neck mass. J Laryngol Otol. 2000 Sep. 114(9):712-3. [Medline]. Noordzij JP, Goto MM. Airway compromise caused by hematoma after thyroid fine-needle aspiration. Am J Otolaryngol. 2005 Nov-Dec. 26(6):398-9. [Medline]. Roh JL. Intrathyroid hemorrhage and acute upper airway obstruction after fine needle aspiration of the thyroid gland. Laryngoscope. 2006 Jan. 116(1):154-6. [Medline]. Nishihara E, Miyauchi A, Matsuzuka F, et al. Acute suppurative thyroiditis after fine-needle aspiration causing thyrotoxicosis. Thyroid. 2005 Oct. 15(10):1183-7. [Medline]. Isenberg SF. Thyroid abscess resulting from fine-needle aspiration. Otolaryngol Head Neck Surg. 1994 Dec. 111(6):832-3. [Medline]. Tomoda C, Takamura Y, Ito Y, Miya A, Miyauchi A. Transient vocal cord paralysis after fine-needle aspiration biopsy of thyroid tumor. Thyroid. 2006 Jul. 16(7):697-9. [Medline]. Pinto RG, Couto F, Mandreker S. Infarction after fine needle aspiration. A report of four cases. Acta Cytol. 1996 Jul-Aug. 40(4):739-41. [Medline]. Mighell AJ, High AS. Histological identification of carcinoma in 21 gauge needle tracks after fine needle aspiration biopsy of head and neck carcinoma. J Clin Pathol. 1998 Mar. 51(3):241-3. [Medline]. Hales MS, Hsu FS. Needle tract implantation of papillary carcinoma of the thyroid following aspiration biopsy. Acta Cytol. 1990 Nov-Dec. 34(6):801-4. [Medline]. Engzell U, Franzen S, Zajicek J. Aspiration biopsy of tumors of the neck. II. Cytologic findings in 13 cases of carotid body tumor. Acta Cytol. 1971 Jan-Feb. 15(1):25-30. [Medline].